With a project located on the site of a massive gold rush, this explorer is attempting to find the hard-rock source of the region's placer gold, and an updated resource is expected any day. The land that Cabral Gold Inc.'s (CBR:TSX.V; CBGZF:OCT) Cuiu Cuiu gold project sits on was once the territory of garimperos, migrating miners who came during the massive Brazilian gold rush of 1978-1995 and panned for gold. It's believed that the garimperos mined some 2 million ounces of placer gold in the area which would make it the largest placer camp in the entire region. The hard-rock source of all that gold has never been identified, but Cabral Gold Inc. is focused on fixing that. Last month, Cabral came one step closer with the announcement on March 21 that it has identified several new high-grade targets on the Cuiu Cuiu property in northern Brazil. The company explained that the "initial 2018 campaign of work involves trenching, mapping, auger sampling, soil sampling, and rock sampling in areas of recent and abandoned artisanal workings." 264.0 g/t gold from the Germano target. The only area of that five that has seen historical drilling is the Jerimum de Cima target. Cabral noted that among the 13 holes drilled there included results of 39m @ 5.13g/t gold and 18m @ 1.17g/t gold. Back in 2011, a previous operator of the project identified an Indicated resource of 0.1 million ounces gold and an Inferred resource of 1.2 million ounces. Cabral noted that it is updating that resource estimate to include drilling performed after 2011 and expects to release it soon. The company expects to begin drilling in June. The region has grabbed the attention of other miners. 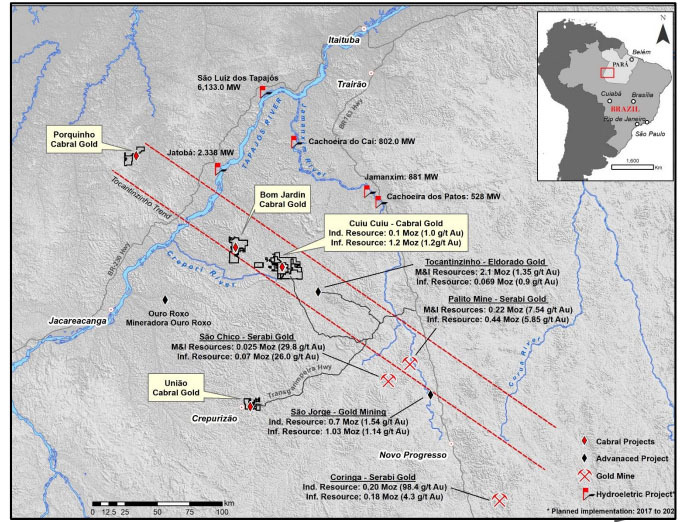 Cuiu Cuiu is near Eldorado's Tocantinzinho's project, which has Measured and Indicated resources of 2.1 million ounces. Neighboring Mato Grosso state has seen a staking rush recently, with Anglo American and Nexa Resources acquiring more than 3 million hectares of land in September and Altamira Gold announcing the additional acquisition of 52,000 hectares. According to Altamira Gold, "the catalyst for this staking rush is a rumored porphyry copper discovery in the eastern part of the Juruena Belt." Cabral has caught the attention of industry observers. Brien Lundin, in the April issue of Gold Newsletter, finds that Cabral has a "near-ideal combination of near-term and long-term price catalysts." On the new resource estimate that is expected shortly, Lundin states, "Just how much this new estimate will grow the resource is unknown, but the underlying data suggest it will be substantial. If so, the estimate's release could be a short-term catalyst for a higher valuation for Cabral." And longer term, Lundin believes that "there's plenty of room for optimism that Cuiu Cuiu can grow via the drill bit. The property encompasses an 18-kilometer gold-in-soil anomaly. It also lies within the Tapajos region of Para State, which hosted the world's largest ever gold rush between the 1970s and 1990s." Cabral "is trading at bargain levels, given Cuiu Cuiu's current resource. Add in the potential resource expansion due in the coming days and the extensive exploration program planned for this target-rich project, and you have the makings of an outstanding vehicle to leverage rising gold prices," Lundin concluded. Gwen Preston also highlights Cabral's potential. Writing in Resource Maven on March 23, she notes that Cuiu Cuiu is in "an area that produced millions of ounces of placer gold and placer riches like that don't come from low-grade deposits." The new resource estimate "will almost double the drill meters in the model and almost certainly increase the count notably," Preston states. In addition, "there are eight zones outside of the resource with gold drill intercepts that deserve the follow up they will now get. Outside of those, Cabral is extending soil sampling and prospecting across the license area—for the first time." Preston highlights the improving infrastructure in the Tapajos region, "A new highway runs past Cuiu Cuiu to the east, there are new hydroelectric power plants throughout the region, and the neighbouring deposit is nearing construction." She stresses that the management team has a lot of experience in Brazil: "In 20 years working in the country they have made four gold discoveries, including the 2-million-oz. Tocantinzinho deposit next door to Cuiu Cuiu, where Eldorado Gold (TSX: ELD) is primed to make a construction decision." Cabral has 31.4 million shares issued and 8 million warrants. The stock is closely held; board and management control around 45% of the shares. 2) The following companies mentioned in this article are billboard sponsors of Streetwise Reports: Cabral Gold. Click here for important disclosures about sponsor fees. As of the date of this article, an affiliate of Streetwise Reports has a consulting relationship with Cabral Gold.